The decline in live TV viewers has been well documented over the years, largely thanks to the introduction of recorded shows and the rise of subscription-based streaming services like Netflix and Amazon Prime. After all, who hasn’t come face to face with the black mirror of a laptop screen, mid-way through binging the latest must-watch series, only to be asked if we’re still watching? Broadcast TV is now competing with a whole host of competitors, including some the industry couldn’t have expected, like the 1.3 billion YouTubers, lead by an army of teenagers in their bedroom, filming shopping hauls, pranks and tutorials. The people who are still watching live TV are likely multi-screening according to Thinkbox, who found 74% of adults surveyed multi-screen each week. TV sponsorship, placement and advertising has long been seen as the most effective way to reach a high volume of prospective consumers in one go, but is that still the case? With a 2.2% decline in the purchase of TV ads in 2017 and a prediction of a further fall of 2% per year till 2022 from TV ad buyers Magna, it looks like advertisers are jumping ship as quickly as viewers. But is there a link between the new mediums and the old? The endless #loveisland tweets from 3.6 million viewers jumping in with their thoughts on the nightly episodes wouldn’t happen without the nightly 9pm curfew to get home and stick the telly on. TV audiences have moved from passive viewers to active parties, sharing their commentary in public forums, in a bid to go viral. Attention spans may be shorter, but social media gives them a platform and shows like Love Island give them a talking point. And as much as social media claims to be ‘social’ (it is in the name after all), it can actually be isolating for users. Social viewing brings back a sense of community and being part of something. We’re no longer watching alone, we’re watching with the all of those 3.6 million viewers. Even if the engagements aren’t direct, the likes and RTs imitate communication and we feel connected… Not to mention the rush of endorphins that come from each notification. For brands looking to advertise, it’s not all negative. There are definitely advantages and opportunities. For one, it’s another touchpoint to reinforce your message. Attention spans are shorter than before according to Microsoft Corp, so getting your content in front of the consumer in multiple mediums is the way to ensure you’re capturing their attention. Brands like Missguided nailed it this summer with their Love Island partnership. 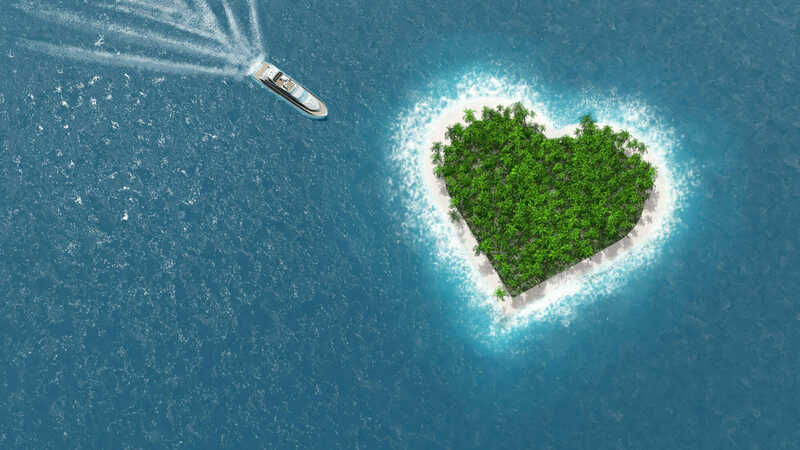 The Islanders were wearing Missguided clothing, there was a travel-themed advert during the breaks, they had sponsored content on the Love Island app and their social tied in, with direct CTAs allowing them to measure the true effectiveness of the TV ad. 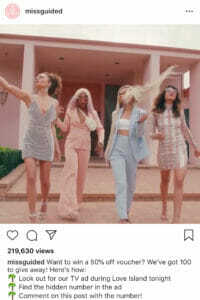 Everyone knows the ad break is just an excuse to put the kettle on, but Missguided used their Instagram content to challenge viewers and get users paying attention to the ads. This meant not relying on TV viewing numbers to measure the effectiveness, but getting a genuine insight into the audience and whether they watched the ad or not. Of course, Love Island isn’t the first show to build a bridge between TV and social, and it won’t be the last. You can bet #GBBO will be trending when Bake Off comes back later this month and national events like the World Cup send social into a frenzy. Social viewing is on the rise, and it’s taking shows like Love Island with it.